...that the Fallen depend on a substance called ether, which only Servitors can produce, to survive? ...that Xûr, Agent of the Nine sells an assortment of Exotic items on weekends at either the Tower or the Vestian Outpost? Remnant of Felwinter is one of the Remnant Iron Lords faced in the Rise of Iron Story mission The Iron Tomb. The Remnant of Felwinter is the modified corpse of Felwinter, one of the Iron Lords who fought against SIVA. Felwinter was one of the Iron Lords who ultimately died in action. 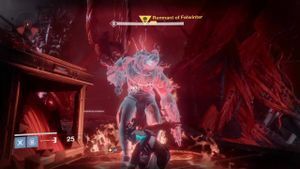 Since his death, SIVA modified Felwinter's dead body with itself, as seen by the Guardian who slain the zombified being. Other remnants include the Remnant of Jolder and the Remnant of Gheleon. The Remnant of Felwinter will spawn from dropping from the ceiling of the arena, and will constantly charge the player and attack him/her with his SIVA Gatling and Launcher and will smash with his fist if too close. The only real way to deal massive amounts of damage to him is too utilize the Iron Battle Axe, which will spawn in the room. Charge the relic with SIVA energy that's located throughout the chamber or by swingeing the axe at the Remnant of Felwinter or the other remnants, and use it to break his otherwise immune shield. Damage him and repeat this process until the Ultra perishes. The Remnant of Felwinter is one of the first Humans, whether currently or formally, that players have to fight. Along with that, the remnant is one of the first to not be considered a machine of some sort or be one of any of the five races that are usually fought, which consists of Fallen, Hive, Vex, Cabal, and Taken.